This is not so much a game as a choose your own adventure book, or an interactive novel/movie. 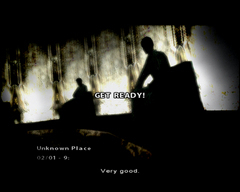 In fact, the game could be attributed more to a movie, since to start a new game you select “New Movie” on the main menu. Not only that, the tutorial level has you walking through a movie set to learn the controls as your very own crash test/3D animation dummy. But first, let me say that I played through this game completely once, collecting extras where I saw fit/ got lucky. It probably took around 10 hours to completion. I sought out to play this game after I played an appetizing demo that came on a PS2 disk. Regardless, I played the PC version for hopes of better graphics, and more accessibility. Also, I tried to play the unrated version, but got some kind of mix, not sure what happened there. Story: The story is linear. The ending is changeable, but is only really decided in the last 5-10 minutes of the game, therefore the game is mostly linear. 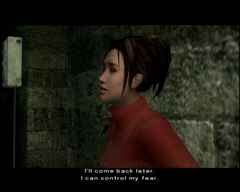 However, the approach that the storytelling invokes gives the player a sense of control. It is possible to make decisions, and even play as both parties to determine the outcome. I will go into this soon. Firstly, you play Lucas Kane, whom is possessed and commits a murder. You then take control of him as you evade police as well as find out what has happened to you. Here you can control the story elements. When you start out in the diner, you can choose to hide the body, gaining you extra time to make decisions, clean your hands, so that the waitress won’t notice you are covered in blood, or not do anything. If you don’t do anything, you’ll go out, the waitress will scream, and you’ll have to escape the diner quickly to continue the game. Or, you can choose the ending where you lose. In these cases, it IS an ending, just not a complete one, though I’m sure you could believe that it is the proper ending, letting the “innocent guy” rot in jail, and throw the game back on the shelf to collect dust, but that isn’t really how to play this game, let alone most. So you will escape from the dinner, and depending on what clues you left behind, Shakespeare, a ticker reel, fingerprints etc. The investigators, Carla Valenti and Tyler Miles, whom you also play, will try and determine who you are. Ultimately Lucas Kane will be discovered as the murderer, like I said linear plot, but you get to choose in what detail. I’m not sure the different ways, but the investigators search for clues in bookstores, and also question victims. I do know that you can have the waitress match Lucas’s face for a profile, which is a little mini-game while I failed, or have the ticker tape matched with the occupation of Lucas which is what happened in my game. Ultimately, the investigators question you at your place of work, where as Lucas you can hide clues, or as one of the two investigators, try and find them. The story is split into chapters. After each chapter you can choose one of the three characters to play as for the next scene. 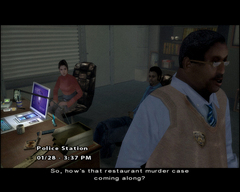 Ultimately, Lucas’s scenes are separate from both investigators, while sometimes the investigator’s scenes are mostly a preference of character. In some scenes you may even take control and switch off between them. This was cool, and necessary, as some scenes force you to look around as both characters, such as at a crime scene, or at the character’s apartments. Regarding dialogue, not only was the voice acting good like I mentioned, but there were usually more than one dialogue tree that would progress that story. I welcomed this, since sometimes I had died, and upon reloading I didn’t want to hear the same 5 minutes of dialogue I had just completed. It also helped to ease you out of the feeling of linearity that the overall plot actually is. Though, like most of the things, once the initial investigators as to who the murderer is, the dialogue trees sort of fade out in importance, as most of the plot is fed to you anyways. This whole beginning portion of the game was fun for me. It really empowered me as a player, thinking that my actions had weight on the plot. Not, only that I felt I was choosing Lucas’s Fate. In my game, I tried to keep Lucas anonymous as long as possible, but I suppose one could do the complete opposite, arousing a lot of suspicion, and leaving clues everywhere. I am unsure how much the plot can be melded at this point, though I’m assuming not too much, and would only change the dialogue in the chapters, not skip over them. Besides directly interacting with the story, it is possible to decipher it through third party sources. By this I mean listening to the TV, and browsing the internet on Lucas Kane’s computer. Even near endgame there are at least a couple objects which indirectly give story. A radio for one gives updates on military and weather conditions throughout the world. All these elements are completely optional, but like the tapes in Bioshock they help give more details and emerge you greater into the story-soup. With the good voice acting and narrator, I felt connected to the characters I was playing, hoping to see more, and to hear the end of the story. But, I found out later that this view would change. window. The developers not only introduced a main enemy, but threw in a new love interest, and destroyed the slow but poignant storytelling up to there. This almost made me want to stop playing the game if it weren’t for the investment of time and emotion up to that point. This is an example of what I have heard about the lack of falling action in game plots, the game raises to a threat, and unfortunately, it tries to keep the action rising, but ultimately falls flat, and not in the good gradual way. Especially this game, which is in itself a movie, should at least try to be consistent with novel devices. The later story moves slow too. Looking online I discovered the story-elements out early on. For the beginning of the game this was useless, since you still got to play it your own way. Later, with the supernatural, it took forever just to get tiny bits out of the story. Mayans, There I saved you a 15 minute scene which does little for the plot anyways. With a game based around storytelling more than action, I am sorry it had to end so poorly, if only the game were continually good all through it. Controls: The controls were made for a console, no doubt about it. There are 3 varieties of control. You have: (I made these names up) context actions; in which you must move the mouse/thumbstick in the movement patterns of the action your character is doing, Memory; in which you must repeat colored directions using the thumbstick/keyboard, and pacing; where you must press right and left with proper pace/timing (Two versions). The memory one was by far the most common, and the easiest, though the least rewarding. It became a bore around the same time as the story starting failing, ironically, being used more and more. During cutscenes it would appear, and depending on your accuracy of the presses you would get different results. Unless lives were involved you could probably fail these events with no real problem, as they seemed more to keep the player occupied/alive during dialogue sections. The fast pacing one sucked, mainly because you couldn’t jam the keys super quick, it had to be a gradual one key press at a time, yet it still needs to be fast. I had the fault of pressing them super fast and failing a helicopter cutscene so many times. AHHH! The scenes using them are quite long, so you had to keep the “breathing” motions going, maybe even for 15 seconds. The slower pacing version is more immersive, since instead of being focused primarily on the button smashing, you usually have this one in the background of the story. IE, for one part you are navigating a basement but have to keep breathing calmly, so the player must alternate left and right keys to keep the meter in the center, not too fast, not too slow. It also isn’t as picky on timing as long as you keep it centered overall. The Context action was the main form of navigation control outside cutscenes, and was my preference. It was abused for some climbing sequences, where you had to move the legs and arms as you rose many times in awkward mouse movements. Notable is that you can slightly move the contextual action and your character will start to do that action, but you can cancel it, and the character will back off before the action is completely initialized. Kind of neat I thought made me feel more in control this way. Otherwise movement besides these were simple. Walking is the usual. However, running is a bit of an issue since you cannot change directions while running or else you will halt. I wish I could be a free roaming jogger, but I guess the game doesn’t want that. Plot the coordinates into the navigations computer before you go to hyperdrive I suppose. On the computer the left mouse button can move the camera around the room for free look. It let me admire the environments and see things that the follow cam would be hard to focus on. I also want to briefly mention the camera. Most of the time the camera follows behind the character. There are cinematic-esque parts though where you are greeted with multiple camera angles, allowing you to move, and see yourself from many positions at once. It is not often I see this technique done in games, since they seem to distance yourself from being the character. In this game though it works, we aren't playing the character's view only interacting with their story, and I felt the camera system was effective and helped highlight points of interest too. animations are not always up to par. Tyler’s smile for one is super scary and will give you nightmares. The textures are blurry, but many items decorate the landscape. Therefore, it is a tradeoff, items are of the low quality variety, but there are many of them detailing the apartments and basements of the game, that if you look at them from a far, they look quite stunning. Boxes, phones, pictures on walls, figures; good from afar but far from good. In this way, I found environments to be quite detailed and a compliment to the detail acute developers. 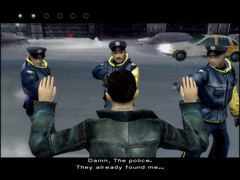 Despite playing on the computer, the graphics were limited in resolution to about 1280x 1024 tops. I did throw on 8x of anti-aliasing, but that didn’t seem to do much. The game wouldn’t have looked better on the console anyways. This game isn’t about the graphics though; it is about the story, which I don’t have to tell you about again. Characters: Different than story, I’m going to introduce a few of the characters to you. First we have Lucas Kane. He is the main character. He works in a bank, and murders someone in a diner while possessed by an ancient Cult that has leaders in every wake of society. I’ve probably killed about 3 hours of the game’s soap-opera right here, but I’ll say a bit more. He does a lot of inner thinking, mostly because he doesn’t have characters to converse with besides himself. Had a girlfriend, no longer, in more ways than one. Halfway through the story he dies. But then, you should stop playing once that happens if you care about story. I still don’t understand the whole coming back to life part, and I guess I never will. 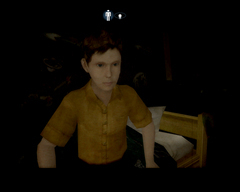 You get to play a few special scenes where he is a kid. These involve sneaking around Metal Gear Solid style and saving/letting burn little kids. Also Lucas is infected with radiation. Tyler Miles: Has a girlfriend who seems kind of whiny, slutty and unimportant, which is why I won’t even give her a character profile. He seems “hip” at least to himself, though is more tired and lazy. His scenes have you jive-walking to find clues, go to work, or interview people, much to his reluctance. He quietly exits the story later in the game, good or bad I couldn’t see. Oracle: Works for a cult, has special matrix-like powers. Can summon you to the spirit realm, except without the dueling and card battles. Captures small children from their beds, given the opportunity. 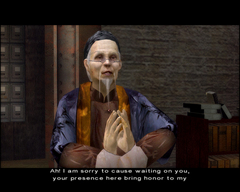 Markus Kane: A priest. He is also a whiny character who doesn’t believe a thing that Lucas Kane tells him. Later he semi-does. Waitress and Diner Guard: The dinner guard is cool. He only has 2 or so scenes, but something about him made him seem cool. Waitress likes to cry and pester you about your dinner’s bill/bloody hands. Mini-games: A good break from the storytelling, some are good, some bad. The good ones are the few I alluded too already, the sneaking around the military base, and escaping from the insane asylum. These are good because they break from the usual mechanics of button pressing and context actions. There is a first person shooting range, but it is one of the poorest shooting ranges in any game I’ve tried, even America’s Army. It is flat out boring, shooting at targets and having to hit so many to hear the next segment of dialogue. Repeat that sequence of events 4 times, and you are already sick of it once you find out the trend. There is the face-matching with Tyler and the Waitress to get a profile of Lucas. I thought I did well on this, but apparently my “sketch” wasn’t close enough. If you’ve played those Warioware games where you must pick the proper face parts, it is almost exactly like that but in longer than 3 seconds. A boxing mini-game relies on the button pressing to success as Carla spars with Tyler. For some reason it was quite fun, and even a bit challenging, as the pattern flashed quickly by and the animation was elegant acting out the moves. A basketball mini-game is similar, just with a different setting. Overall, the mini-games were good, though ones that simply relied on the same button matching and tempo were usually not that great unless they felt strongly motivated by action or just felt special. Sound and Music: Sound is fine, I can’t recall any moments that stood out to me where the sounds were brilliant. Not a game that requires surround sound either. Music WAS good, and had the mopey tone of the plot and its characters in a snow-laden city. Though, while some songs were used in one scene and then dismissed, others reappeared constantly. This isn’t in the way of the Battlefield Themes where they may have different tones and moods, the songs were the same. The main theme for one didn’t seem to be used that often at the beginning, but I was getting sick of hearing it after a while. I will comment that the music is original, and that especially songs that appear during some of the minigames or cutscenes that aren’t atmospheric, and are meant to be on the radios/TVs did a swell job capturing say, a country, rock or [genre] ambiance. Bonuses: You can collect point cards which can be redeemed for soundtrack pieces cutscene sequences and develop commentary. The soundtrack unlocks unfortunately can only be played within the game. I would have liked to have been able to find them in a folder for my own personal use after unlocking them, much like Leisure Suit Larry 7 did with its pin-up art. Alas, it is somewhere hidden in the game files, despite your masterful unlocking. The commentary discusses the game creation, voice acting, etc. There are also a couple of joke cutscenes available for unlocking. One has a strip show from Tyler’s girlfriend, but since she is kind of annoying, I felt the scene was overly drawn out. Another one has Tyler being molested by the crafty Bookstore owner, which was quite funny. One bonus you can unlock shows a vignette of every character model in the game. If you don’t want plot possibly spoiled, don’t unlock it. It is the last one on the right of the cinematic unlock menu IIRC. Lives: Wasn’t sure where else to put this. During the course of the game you have a set amount of lives. You can have up to 5, and scattered around the levels are extra lives. I’m not sure if and when they reset, but I’m assuming they do. The function of these lives is to prevent you from having to redo cutscenes over and over. If you are working on a cutscene with the button memorization or the pacing part and fail, it will show a failure clip and take away a life. Fail with no lives left and it is Game Over, or the story ends there with a tragic ending of sorts. I felt these were a pain, mainly because the memorization/pacing sequences in and of themselves became tiresome, but once you got the hand of the intricacies of the buttons you had to press, the lives were hardly an issue. Though, playing with one live really set you on your toes for fear of redoing the part. Conclusion: I recommend this game, because it felt original. Yes the plot does degrade but the time spent with the good parts are certainly engaging and worth trying the game out for. Think of it as one of those interactive novels; to try and make it anything else would be a disappointment. Strong characters and dialogue with some good soundtrack selections. Weird gameplay mechanics, with some surprises. Not sure what happened to all the great creative spirit near the end parts. Yes that is a nice idea but have you ever thought of going up to the biggest guy on the subway and telling him your thoughts on this. I wonder what he might do, or would you even do it. Whole story is moving around main character that is Lucas Kane. Graphics is very clear. It seems real. 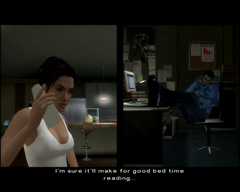 Animation quality plays an important role in game, which can be seen in this game. Overall I will give it marks 2 out of 10.